In usual Fiat style, the 173 inch car has a commendable selection of engines and almost none are available: a 1.6 litre petrol, a 2.0 litre petrol (I drove the twin-carb 2000 with revised rubber mats), a 2.0 petrol with fuel injection and a 2.5 litre diesel which Fiat UK refuse to let out on loan to anyone except the chap from the Express. It’s that slow but in London you’d never find out. The product of much revision, the 132 is now even more a car for any man interested in motoring. The Fiat sports fine Pirelli P6 tyres and modern alloy-like rims, offsetting the flowing lines (which seem to have inspired BMW, some suggest). The car is rear-wheel drive. To test the car, I took it from Peterborough to King’s Lynn via Holbeach St Johns, on some challenging back roads. The seating was satisfactory – the product of intensive research by Fiat into synthetic foams – but the rubber sealing strip at the base of the window came loose and fell off as I rolled into the pub for lunch and some refreshment. In between lunch and tea, the other strip fell off as well but, to be fair that might have been something to do with a kerfuffle over a parking incident (I was watching this in amazement as I had a Craven “A” in the beer garden). The Fiat got a bit of a dent to the rear wing. The 132 has a top speed in 3rd of 79 mph, which is very good for the local roads hereabouts. The 2.0 twin cam is flexible and can show many of its peers a clean heel, running the 2.3 litre Cortina Ghia a very close second, actually. The engine has four-cylinders, with five main bearings (something that ought to give Rootes pause for thought), a bore of 3.3 inches and dohc valve gear. Fiat have laboured over the suspension, with coils and a double wishbone up front and a live axle with lower radius arms at the rear (coil sprung). This lent the car decent roadability even on negative cambers with November leaves. The ponderous steering is alright – Fiat reckons a recirculating ball set-up is good enough. It is. After a night in King’s Lynn I motored down to Felixstowe and took the ferry to Rotterdam, thinking it’d be a good chance to have a long-weekend (it was Friday) and stock up on Jenever while about it. It was a foul crossing and the rolling waves caused a toilet bowl to drop from a truck, leaving something of a dent in the roof so Land Windermere had to sit on the left side of the car for the remainder of the trip. After some trouble starting up, we were off into Rotterdam’s busy streets. The ergonomics don’t impress: the driving position is not Italian enough (it is a Fiat) and the rake-adjustable steering does not move down enough. The long-travel of the foot pedals also got a bit wearing in heavy traffic. Sticky like a toffee cake is how you’d describe the reverse gear, and the others are recalcitrant too. Good job the engine is flexible. A headlamp bulb blew on the way out of Rotterdam and, luckily the Fiat dealer in Aachen could help replace the disc brake pads (with some helping encouragement from Fiat’s UK press wallah) – they were about to close for the day when I rolled in with squealing brakes at lunch time. After a spot of something German (small noodles with mushrooms), I set off again towards St Vith in Luxembourg or Belgium, keen for some mountain driving. The washer motor failed and something in the noisiness of the suspension led me to suspect rubber-bushes in the front-roll bar’s body clamps had slipped a bit. I had to have this seen to on my return. The mechanic advises fitting Ford bushes. St-Vith has one good hotel. The other ones aren’t so good but the breakfast improved my outlook as I charged onwards to Luxembourg (in Luxembourg). The 132 managed 23 mpg, overall. The brakes vibrated quite a bit on the mountain roads. The front tyres seemed rather worn. On high revs (Luxembourg is hilly) the 132 misfired and the fuel gauge failed. I had a look under the forward hinging bonnet which had to be held in place by Land-Windermere’s tripod because it would not stay up. And it would not stay closed – the striker pin had sheared. I jammed it shut with some cable. I found out how to re-attach the bottom radiator hose during lunch- Luckily not much coolant had leaked before I spotted the drip. The radio had a good treble sound to it. Getting back to driving, the under-steer is not bad and I liked the velour seats but they got grubby with ash and apple cores. (Part 2 of the article was published in the Skegness Standard in Jan., 1980. Coming soon). Much more handsome than many of its contemporaries, IMHO. Were they really that frangible? I know they rusted enthusiastically, but I don’t recall them falling apart otherwise. 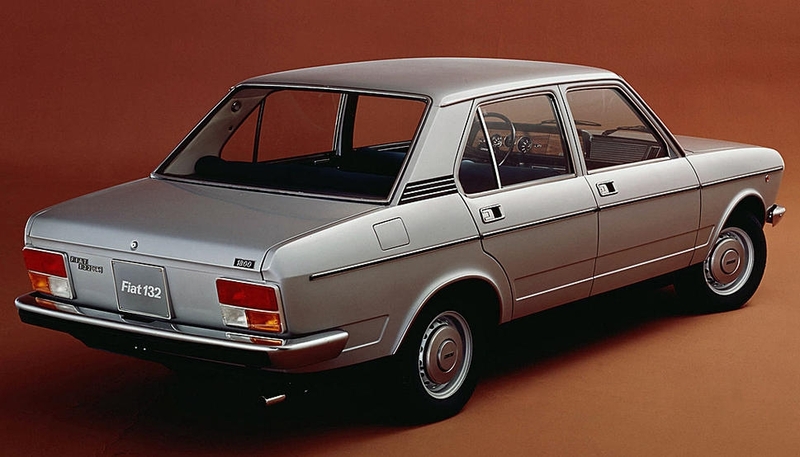 Sitting there blushing in its glory, the Fiat 132 demonstrates ground clearance that would embarass a modern BMW SAV. My memory of goat trails masquerading as main roads from those days show how far we have advanced since those days in the infrastructure sense. Perhaps in a nod to saloons of realistic height from those ancient times, the wholesale change to SUVs by the buying public is merely a reversion to what seems reasonable to the average vehicle-buying serf of today. After all, you have to get in and out of the damn thing! I think that might just be perceptions because the Fiat 132 is listed as having a 124mm ground clearance while the latest BMW 3 series has 137mm. Then it should be noted that the lowest point defining the ground clearance of the Fiat is most probably its differential casing and because the 132 has a live rear axle this ground clearance will be maintained under rear wheel articulation. the BMW’s clearance is variable because it has independent suspension. That’s the reason why proper (single purpose) cross country vehicles still have live axles at least at the rear and in really serious cases also at the front. Thank you for these precision Dave , Apple’s Siri has nothing on you. Maybe it explains why the 3 series’s ground clearance since to be different for countries like India ? I’m indebted to the late Archie ( I haven’t actually heard of his demise but fear it may have taken place) for educating me about a 132 diesel because I hadn’t realised there was one on these shores. As opposed to the Mirafiori, diesel models of which were at some time in the remote past absolutely ubiquitous in the taxi trade. Choice of 2.0 or 2.5 NA engines as I recall, whose fitment entailed the provision of one of the most unlikely bonnet power bulges in recorded motoring history. I had to check that bonnet. Yes the bulge looks kind of out of place. Like they didn’t want to make a big fuss out of it, “Move on, nothing to see here” kind of vibe. Thanks – as far as I understand it Archie Vicar retired at the end of 1981 and, I think, passed away a few years later. He requested to have his ashes scattered at the Wolseley factory in Ward End, Birmingham. He was fortunate to have a career that coincided with the most interesting times in motoring spanning the late 50s to 1981. I have tended to pick the later work for transcription but we have some of his late 50s peices in the archive. If anyone is interested, his colleected work would make a super (if very large) book for motoring enthusiasts. Richard: I knew my eyes we’re getting worse; I’d never seen that section of the archive for some reason. But I can see a weekend of Vicar-isms ahead. Crack open that Guinness crate – it’s gonna be a long ‘un. Cheers! Andrew: Lucky you. I can remember the first time I opened the door to the store-room where the Vicar clippings and cuttings were accumulated. Imagine ten Aladdin´s Caves, filled with Fruit Gums, fine machine-made cigars, cratess of Marsala and oloroso Sherry and stacks of Craven “A ciggies. One of these days I´ll have to do some kind of list of the articles, if nothing else.